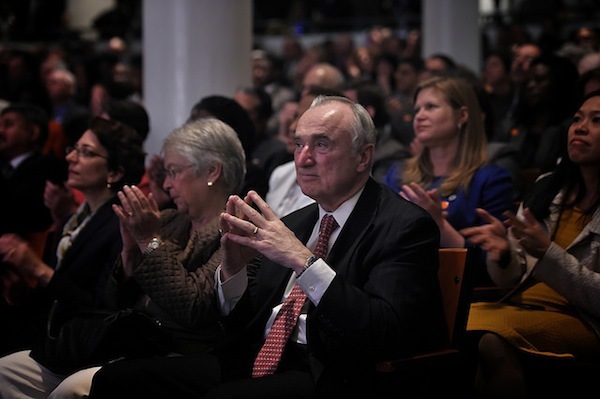 Police Commissioner Bill Bratton in the audience as Mayor Bill de Blasio delivers his 100 Day Speech at Cooper Union on Thursday, April 10, 2014. A week before New York City mayor Bill de Blasio and police commissioner Bill Bratton marked the first 100 days of their tenure, they posed for pictures with another Bill at a black tie fundraiser. Bill Rudin, one of the city’s most influential real-estate developers, talked up the new mayor and the new(ish) commissioner at a fundraiser for the Police Foundation. The Police Foundation, which was celebrated by some of the city’s wealthiest that night, uses donations to fund research supporting policing philosophies and tactics that guide the NYPD. The Rudin family, longtime donors to the foundation, was honored at the swanky gala with keepsake bullets and bulletproof vests courtesy of the NYPD, which has received over $120 million from the foundation since the 1970’s. Later that same month, Bratton was joined by retired US Army General Stanley McChrystal at a forum titled “21st Century Leadership” on a rainy night in Manhattan. McChrystal was the former commander of the Joint Special Operations Command and the commander of all U.S. military operations in Afghanistan. They joined conservative pundit David Gergen to discuss the parallels between the military’s counter-insurgency tactics abroad and those of the NYPD—”the seventh largest army in the world”, as former mayor Mike Bloomberg once reminded us. Bratton rejoined the NYPD amid calls for widespread reforms of the NYPD. De Blasio campaigned on a platform of police reform but raised eyebrows when he appointed Bratton, long affiliated with zero-tolerance policing that many say leads to police abuse. While some saw in de Blasio’s mayoral win a repudiation of excessive police harassment, others were skeptical of reforms with Bratton at the helm. The commissioner’s two recent appearances amplify those questions, and add to them. But for New Yorkers who aren’t homeowners (i.e. renters, the homeless, etc) rising real estate values are often precursors to rising rents and gentrification. One stroll through Harlem shines a light on a reality for low-income and homeless residents living there: a heavy police presence coupled with an influx of nouveau residents. Since the Tompkins Square riots of 1988, gentrification has divided those who see it as economic progress and those who say it displaces residents—low-income people of color in particular. Bratton’s role in the policing of Skid Row, a high-poverty area of Los Angeles, as head of the LAPD is perhaps a model for how policing plays an essential role in the gentrification of high-poverty neighborhoods. Bratton’s 2006 “Safer Cities Initiative” in Skid Row targeted the homeless–even as services and living arrangements set up by their advocates were based there. “Endless police sweeps and night busts” included attacking tent encampments with water cannons. Those efforts were largely, if not completely, motivated by the city’s concurrent efforts to redevelop the area. Bratton himself points to policing as the necessary ingredient for an inviting business climate. Creating “safer communities” leads to tourism and job creation, he explains. But when asked if the relationship between economic factors and crime work the other way–poverty as a cause of crime (which might suggest crime-alleviation through investment aimed towards the poor, not business)–he thought the idea “backwards”. “The cause of crime is people committing crimes”. In other words, for Bratton, crime is a personal decision largely void of societal factors. This doesn’t bode well for panhandlers, jaywalkers, food vendors or teenagers dancing on a train for money–targets of Bratton in 2014–whose criminality is self-evident, as far as he’s concerned. While police departments are paramilitary by nature, their militarized mentality at home mimics counterterrorism efforts abroad. Consider Bratton’s excitement over predictive policing–being able to pinpoint, through computer algorithms, where crime will occur. It is rooted in his vision for pre-emptive policing but goes far beyond sending extra cops to a shady street corner. At the LAPD, Bratton’s thirst for high-tech predictive policing was met by researchers hired by the US Army to map insurgencies in Iraq and Afghanistan. The observations of researchers that “terrorist and insurgent activities have a distinct parallel to urban crime” echo Bratton’s recent comments that policing runs a “parallel track” to counterterrorism. Similarly, in a 2012 interview with Bratton, CNN’s Piers Morgan compared Bratton’s ability to win over support of some minority community groups in Los Angeles with British Prime Minister Tony Blair’s negotiations with terrorists: “Whether you’re dealing with gangs in Los Angeles or terrorists, wherever it might be… You have to try and make them feel inclusive.” Bratton nodded and proceeded to plug his book on collaboration. That night wrapped up with McChrystal remarking that military officers “went to school on what Bratton introduced”, the moderator beaming about “lessons learned from the military to the civilian world” and Bratton’s announcement that NYPD officers would be receiving hi-tech crime-fighting computer tablets shortly. Last week Bratton supported the idea of surveillance drones for local law enforcement and revealed that cops specialized in counterterrorism were already being sent into NYCHA housing. One has to wonder if such an Orwellian future for New York will affect residents of all social strata equally. The smart money says it won’t. Conversations about post-9/11 life in Bay Ridge and post-Paris surveillance, Islamophobia and more. The police department’s embrace of data-driven policing, accelerated by new technology developed by the military and corporate America, is about to take a turn from tracking crime that has occurred to predicting it. What does that mean for civil rights and communities of color? Reports indicate the NYPD is under pressure to withdraw a 2007 report on radicalization. Defenders believe recent tragedies prove the report was prescient. But critics have long taken issue with the breadth of its conclusions.